“27th Thursday rather fine but cloudy I did my choars was at the office all day & evening came home at 8 ½ & went to bed at 9 ½ tiard lonely & sick Expressed 400. to Wellman. “28th Friday cloudy damp weather I did my choars was at the office all day & in the evening came home about 8 ½ & went to bed 9 ½ tiard & lonely & about sick. “29th Saturday rather a cloudy damp day & evening. I did my choars was at the office all day & evening came home about 8 ½ went to bed about 9 tiard lonely & about sick. Caroline came down & stayed over night with Elizabeth. “30th Sunday A cloudy damp day & evening. I did my choars went & got Warrens Waggon & carried Caroline & Elizabeth to H Goulds & I went to Naperville and got a vest cut came back Charly & Elizabeth went back with Caroline & _______________ wagon home & wrote some etc went to bed between 8 & 9 tiard lonely and nearly sick. “31st Monday rather fine cool & some cloudy. I did my choars was at the office all day & in the evening came home about 8 ½ & went to bed about 9 ½ tiard & nearly sick. “November 1st Tuesday A fine cool & some cloudy day I did my choars was at the office all day & evening came home about 8 ½ & went to bed 9 ½ tiard & sick. “20th Thursday fine cool weather freezes a nights I did my choars was at the office all day & evening came home about 8 ½ & went to bed about 9 ½ nearly sick. “21st Friday rather fine cool weather. I did my choars was at the office all day & evening came home about 8 ½ & went to bed about 9 ½ lonely & nearly sick. “22nd Saturday A fine day & beautiful evening. I did my choars was at the office all day & evening came home about 8 & went to bed a little after 9 tiard lonely & about sick & had the blues Richard Chandler wife & Mrs Potter went to Naperville came back & she & sister had a spat & they were a little cross & it made me feel lonely & evening was out of gear. “23rd Sunday A fine pleasant day & evening. I did my choars was around home all day & evening was at office twice choared round etc went to bed about 9 tiard lonely & about sick. Mrs Potter went to Meeting & about 3 oclock started Methadist meeting & went up to Griffiths & Williamses Sister went home with York & wife about 2 oclock. “24th Monday rather fine weather but cloudy I did my choars was at the office all day & evening came home at 8 ½ & went to bed about 9 ½ nearly sick. “25th Tuesday rather fine weather for the season. I did my choars was at the office all day & evening came home about 8 ½ went to bed 9 ½ nearly sick [in margin] Charles up to Garry. For those of you following our blog of Hiram Leonard’s diary through the Civil War years, many have asked about Hiram’s constant illness. Please enjoy learning a little more about the beloved shop-keeper turned weather reporter who has brought us as much information about the days that he lived as he has about his ill health. Please also join us this Sunday evening at our 7th Annual Cemetery Walk to learn more about two of Hiram’s housekeepers, Mary Wray and Caroline McNelly Wray, who later became Hiram’s wife. For more information about the walk see our earlier post here https://warrenvillehistorical.wordpress.com/2014/09/25/seventh-annual-cemetery-walk/. Hiram grew up in the Berkshire Hills of western Massachusetts, in the town of North Adams. As many people in the 19th century followed chain migration west, Hiram followed his Massachusetts neighbors, the Carpenters, west to Warrenville in 1835. Abel and Philo Carpenter had made the initial journey to Chicago in 1832. Philo was coaxed further west by a Julius Warren, a New Yorker selling off his recently settled land in the new town of Warrenville. Abel would soon follow and start Warrenville’s first general store and marry one of Julius Warren’s sisters. News of promising new ventures spread quickly back to North Adams where times were difficult for many. Hiram Leonard joined the group of Easterners heading west in the hopes of success. As a bachelor, Hiram moved to Chicago at the age of 25 and clerked in Philo Carpenter’s drug store for a short period of time before buying land from Abel Carpenter in Warrenville and striking out on his own. Hiram’s home at 3S381 Winfield Road was finished in 1838 and he began helping cultivate the businesses of the growing town of Warrenville. Hiram was a man of all trades, cutting hair, writing deeds, repairing clocks, and grafting fruit trees. 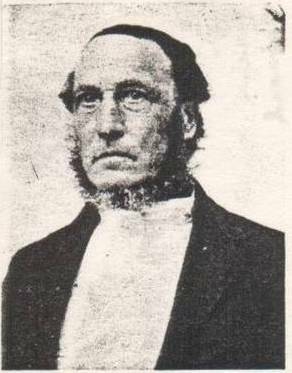 Officially he was a justice of the peace, but also worked as a broom manufacturer, merchant, druggist and post office master. With many jobs and endeavors to pursue, Hiram was a busy, busy man. In 1859 his own store was built and opened on Big Woods Road near the river, present day 28W180 Warrenville Road. Not only did his constant work tire and stress Hiram, but he also dealt with many personal trials that no doubt added to his burden. Hiram’s sister was also mentally-ill for most of her life. Hiram took care of her and ensured that she had round-the-clock caretakers. The stress of nursing his sister is clear from his journal. She was eventually committed in the summer of 1862 and as the devoted brother, Hiram saw her to the mental institution in St. Louis. Although Hiram was a bachelor, for many years he had helped his housekeeper, Mary Wray’s family. He raised her two children and provided all that he could for the entire family. After her death, Hiram continued to care for the family. When her son, William went off to war in 1862, Hiram employed his wife Caroline and helped her care for her son. William, like many Civil War soldiers tragically perished in the bloody battle between North and South. Hiram continued to care for Caroline and her son, William Wray, Jr. and at the age of 64 he married her, a widow just 35 years of age. When Hiram died on November 6, 1878 at the age of 68, Caroline and her family inherited his property. His home stayed in the Wray family for many years after. “13th Thursday fine weather for the season. I did my choars was at the office all day & evening came home about 8 ½ & went to bed about 9 ½ tiard lonely & sick & downhearted. “14th Friday fine cloudy weather. I did my choars was at the office all day & evening came home about 8 ½ & went to bed at 9 ½ tiard lonely [in margin] Carpenter got home from Massachusetts. “16th Sunday rather a fine day but cloudy in afternoon & evening. I did my choars & went after my cows below Hunts new school house, my cows got out of Hoyts into Carpenters & Waddle turned them into the road. I hunted till near noon, I picked a few apples what I had, & choared round the house did my choars went to office in evening came home early & went to bed about 9 nearly sick had been all day slep but little last night [in margin] Mrs Stone stayed with Leb. “17th Monday rather fine weather for the season, I did my choars was at the office all day & evening came home about 8 ½ & went to bed about 9 ½ tiard & nearly sick & lonesome. “18th Tuesday rather fine weather for Oct I did my choars was at the office all day & evening came home about 8 ½ and went to bed about 9 ½ tiard lonely & nearly sick. Mrs. Potter & Charly had been at home all day she was more pleasant & I was more at home—than for the last 6 months [in margin] all was right for the first since April. “6th Thursday A cold cloudy squalley day & evening. I did my choars was at the office all day evening came home at 8 ½ went to bed at 9 ½ lonely & sick. Daniel Jones got here on furlough. “7th Friday A cold raw squally day with _______ I did my choars was at the office all day & evening came home at 8 ½ went to bed 9 ½ sick [in margin] _______ John Lewis at Naperville. “8th Saturday rather fine cold weather for October. I did my choars was at the office all day & evening came home 8 ½ went to bed at 9 ½ nearly sick [in margin] Eliz had a letter from George. “9th Sunday A cold morning froz some a fine cool day & evening. I did my choars was round the house the most of the day fixing corn crib & hog pen, went to the office between 11 & 12 wrote some in evening & went to bed between 8 & 9 tiard & sick. “10th Monday rather fine weather for the season. I did my choars was at the office all day & in the evening came home about 8 ½ & went to bed about 9 ½ lonely & sick. “11th Tuesday rather fine weather for the season. I did my choars was at the office all day & in the evening came home at 8 ½ & went to bed at 9 ½ nearly sick & lonely.